We are just a couple of days away from the Google I/O where Google is bound to unveil its very own 7 inch tablet, tentatively called the ‘Nexus 7’ and today we are back with a new leak which gives a detailed look into the specs of the tablet. The picture which you see above is ousted by Gizmodo Australia which was able to lay its hands on what they call is an internal training document. 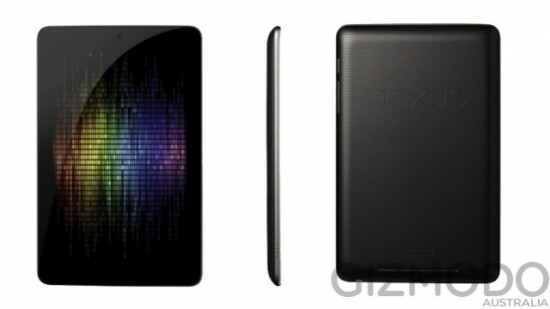 Yes, the final Nexus 7 tablet could look as you can see below, carrying the ASUS engraving on the rear as the tablet is being built by ASUS and is said to arrive on Android Jelly Bean which could be numbered as Android version 4.1. Now the specs included in the Nexus 7 are indeed sweet and the tablet is said to be arriving in two storage versions which would be an 8 GB version for just $199 and the other, 16 GB with a price tag of $249. Now the real question is how real this leak is, for now it looks great but then we cannot say anything until Google takes the centre stage and puts the ‘Its Official’ stamp on this leak. But a quad-core Android Tablet running on Android 4.1 Jelly Bean and IPS display priced at $199 is indeed sweet. Look out Kindle Fire, Nexus 7 is on its way!